The new Twisted Hobbys / RC Factory Crack Yak 55 EPP Model is a 31.5" (800mm) 3D RC plane in a striking blue or gold colour scheme. This one is the gold version as shown in the picture, superbly designed by the guys at Twisted Hobbys. These models follow the same construction as the Edge 540 and Sbach EPP models and offer unlimited 3D performance. 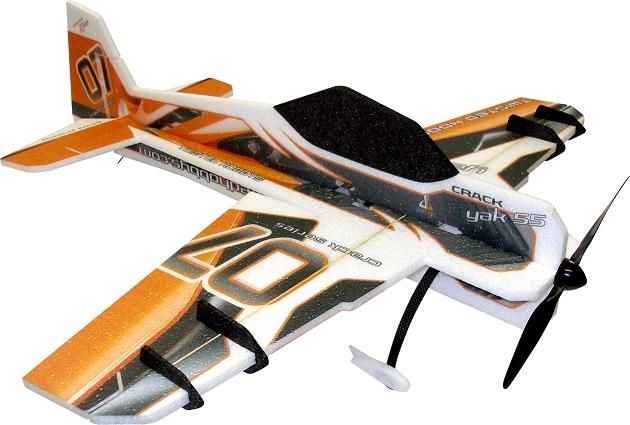 Designed for 60-80W motors (e.g AXi 2204/28) and 8-12A ESC these 31.5" RC EPP planes are great calm-weather outdoor models but also suitable for some indoor flying. If you are looking for an indoor EPP model please consider the similar Lite series and SuperLITE series models, which are far more suitable for flying indoors. For construction, standard CA can be used throughout. Foam-safe CA is not required and not recommended. Checkout the fast-forward build-video below of the similar Edge 540 model! Next-day UK delivery† with a one-hour window (Communicated by SMS or Email) is available for £5.95 on all our model aeroplane kits and accessories above £41.95. Just order by 3pm and choose the appropriate service in the list of shipping options in your basket. We also offer great shipping prices worldwide on all items using DHL and Royal Mail services for fast and secure delivery of your items. † Mainland UK only. Charges and delivery duration for Scottish Highlands, Scottish/Western Isles, Northern Ireland and other Islands will be higher. Buy with other products at the same time and save money!